Rio Grande City High School After School Centers on Education (ACE Program) Presented "Pedrito's Road" a play based on the novels "Pedrito's World and Pedrito's Road" by Arturo O. Martinez a local writer. 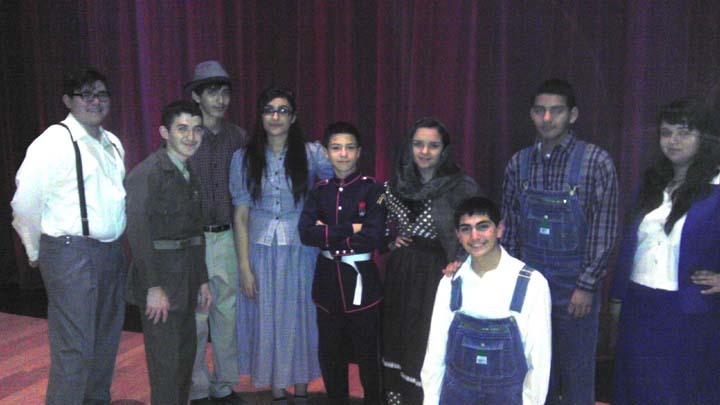 The play was directed by Mr. Ricardo Lee Lopez, Jr. (Instructor) and the cast's performances were fabulous. The crew also did an excellent job. The cast members included, Javier Guerra who played "Pedrito", Wistano Barrientos who played his father, Fernanda Benavidez who played the mother, and the supporting cast members included, Ciara Sepulveda, Amy Olivarez, Luis Vasquez, Jose Cantu, Darren Garcia, Edgar Santos, Olga Cesar and Viviana Garcia. The crew included; Saida Guerra, Alexandria Garcia, Arled Gonzalez, Daisy Garcia and Jacqueline Leal. The plot in Pedrito's Road is of a young Hispanic boy becoming of age and wanting to demonstrate that Hispanic heritage is strong and has produced many heroes. Pedrito gets an idea to have the main street in his town named after a Hispanic war hero, but had a difficult time getting his community to sign the petition that he was circulating. His actions have repercussions for his followers and that saddens him very much. Finally, the Hispanic community gets rewarded not by having the main street bear the name of a Hispanic hero but an even greater success by having a brand new high school named after him. The play demonstrates the impact a person can have just by remaining motivated and diligent. The ACE Program is an after school program designed to train students in difference aspects of arts, and educational goals to enrich their learning and creativity for a well rounded education. The ACE Program is under the direction of Mrs. Adelina Villarreal, who works closely with the instructors to insure program success. Congratulations to all the members of the ACE Program students and their instructor for a job well done. (RGCCISD Public Relations).